Warning. Some or all parts of this plant are poisonous! 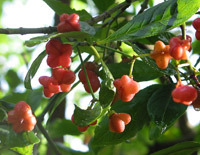 The strange fruits of the spindle tree should be collected during October when they are pink. Just pick them carefully from the tree and store them in paper or cotton bags or in buckets. Spindle is a difficult one to extract and we have found it is generally easiest by hand, even though this can be slow! Each fruit contains up to four seeds – one in each of the lobes of the fruit. The lobes are easily opened and the orange-coated seed can be gently squeezed out. Store the seeds in a paper bag for the short-term. These seeds require warmth before a period of cold. The extracted seed should be mixed with equal parts horticultural sand or a sand/compost mixture. Use 50% leafmould or peat-free compost and 50% horticultural sand. For each handful of seeds add two or three handfuls of mixture. Add the seeds to a plastic bag and loosely tie the top. Place the bag somewhere warm (airing cupboard is ideal) and leave for two or three months. Keep checking to make sure they haven’t dried out and add water if needed. This should take you to December or January. Select a pot that has enough room for the contents of the bag (and a bit more) and put a layer of stones in the bottom. Cover the stones with sand. Place the seed/sand/compost mixture on top of this and cover with 2-3cm sand. Label the pot and stand in a shady spot outdoors. After a few months, signs of germination should be seen and the seed can be sown. If the seeds haven’t yet begun to grow, it may be necessary to wait another year! Keep the seeds moist throughout the summer. The seeds can be sown in containers or a seedbed. In a small pot or tray sow seeds thinly and cover with no more than 5mm of compost or grit. Firm gently and water. On a seedbed broadcast the seed quite densely – aim for about 10-20mm between seeds. Firm with a roller or board to press the seed well into the soil. Cover with 5-10mm of grit. Ensure that spindle seeds are kept moist at all times, but do not saturate the compost as the seeds may rot. Grow the plants in their bed or pot (transplant when big enough if sown in trays) for a summer. In winter, transplant them into larger pots and grow on for a further year or so. Feed occasionally with a dilute liquid feed.